PARADISE (BP) — Members of Paradise Ridge Southern Baptist Church in Paradise have asked Pastor Bob Sorensen if they will continue to have a church, but not because their building is gone. They ask because the Camp Fire destroyed much of their community. While the church building still stands — “an amazing thing,” Sorensen said — his home was destroyed by the fire. On the day the blaze overwhelmed Paradise, Sorensen and his wife Linda got the call that their granddaughter’s school was being evacuated. The typically 15-minute drive turned into an hour-and-a-half. It required five hours of driving amid fire and smoke to make it down the ridge to safety. With nearly 80 reported deaths — and counting — the Camp Fire is the most lethal in California’s history. Hundreds still are missing and nearly 10,000 residential and commercial structures have been destroyed. “The fire came on so fast, and it was just mass confusion,” said Mike Bivins, California Southern Baptist Convention Disaster Relief director. The roads into and out of the towns of Paradise and Magalia are limited. “The fire seems to have trapped more people than was originally figured,” Bivins said. sen’s from survivors in shelters who had to run and drive for their lives to escape the fire. First responders continue search and rescue efforts, using cadaver dogs to help find victims. Emergency utility crews are in the area to ensure that electricity, propane and gas will not create hazards for residents when they are allowed to return. Once the responders complete their jobs, Bivins and DR volunteers will begin working with churches in the region, assessing how best to support the pastors, congregations and communities, many of whom have lost homes and loved ones. Bivins noted non-perishable items such as clothes and blankets are not needed at this time, rather funds to provide gift cards and items for survivors. For now, DR chaplains are serving with the American Red Cross to provide spiritual care for those in shelters, and CSBC laundry and shower units are set up at First Baptist Church in Gridley. 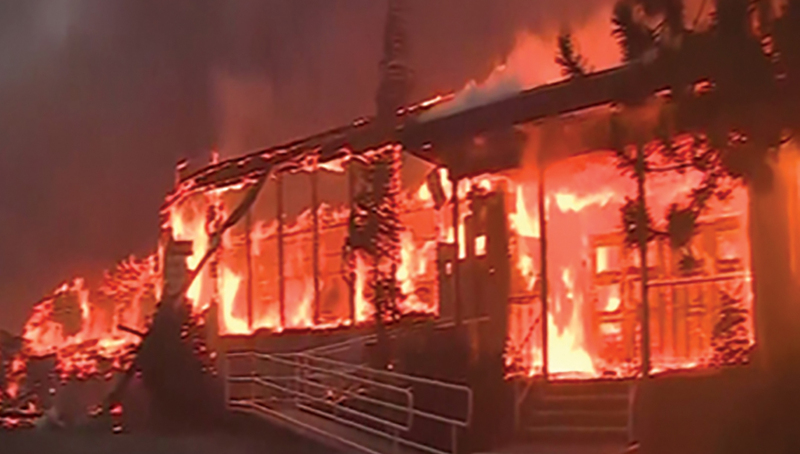 In Paradise and Magalia, three Southern Baptist churches miraculously survived the blaze: Paradise Ridge, First Baptist Church in Paradise and Magalia Pines Baptist Church in Magalia (see story this page). Charles Woods, director of missions for Sierra Butte Baptist Association, stays in touch with those pastors every day. For Paradise, residents are wondering what the next steps will be for their community, but when people ask Sorensen if he plans to stay, he says that decision is not his to make.